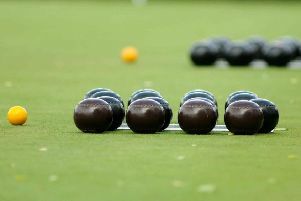 There was yet another change at the top of the Louth Indoor Bowls Club Morning Triples League last week. Two comfortable wins moved Highgate Wanderers from fourth to first on shots difference with the top three teams all on the same number of points and games played. Highgate beat Mudlarks 24-10, inflicting their opponents’ first defeat in six games, and followed up with a 15-2 win over Wasps. Previous leaders The Jays only had the one game which they won, 15-7 against Dreamers, and slipped to second. Magpies also just had the one game, won 14-9 against Two Plus One, which left them in third spot. Three points behind the top three are Yorkies who didn’t play as their scheduled opponents failed to turn up. Mudlarks consolidated fourth place with a 17-9 win over In A Minute who also lost 11-8 to Dreamers. Bottom team Lightning were well beaten 23-8 by Two Plus One in their opening game, but improved against Wasps and were level at 8-8 before losing ground to go down 20-11. They remained just three points behind Hornets who lost 13-6 to Busy Bs and have a game in hand. * There were two excellent games in the Australian Pairs between the leading contenders. In Group B, John Williams and Joan Foster suffered their first defeat when beaten 15-12 by Paul Hayman and Ian Bertram who pinched top spot from their opponents on shots difference. Group A leaders Tony Powell and Liz Draper were also beaten, 14-9 by in-form duo Vic Ball and Mike Norton, but kept hold of top spot on shots difference from Brian Culham and Neil Castle who beat Derek Blow and Pauline Thornton 13-6. Ball and Norton are in third, two points behind with a game in hand.